Email marketing is the perfect tool to showcase your products to partners, suppliers and customers. Promote your products with colorful graphics, images and video. Expedite supplier communication with 21st century communications tools. Educate your clients with product information that is too detailed for a phone call. A simple and easy to use web-based interface makes it easy to Drag and Drop pictures and video of your products into a professionally designed newsletter or e-brochure. Email Campaigns are faster, cheaper and more effective than traditional mail. Clients receive content-rich messages and can easily click through to your website. Professional analysis tools like Online Surveys provide instant, measurable feedback from your clients. Email Analytics and Tracking provide real-time reports that are viewable 24 hours a day, seven days a week. 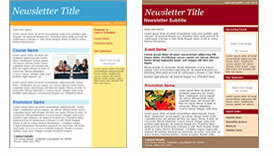 Choose from over 300 professionally designed newsletter templates specifically designed for your industry. Benchmark Email helps you automate and roll-out your email marketing campaign easily and efficiently. You can deliver custom and highly personalized messages that will give your readers the critical information that they need today.